When you plan meals with Bostrom Farms pork, beef, and chicken, remember to bring more flavor to your dishes with the sauces, marinades, and condiments that transform a meal into an experience! 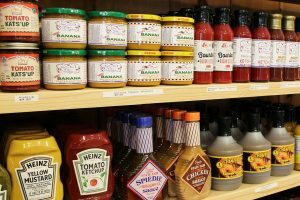 Stop in to our retail store for locally made and regionally celebrated sauces and marinades, including a variety of barbecue and hot sauces for pork, beef, and chicken, plus traditional ketchup, mustard, relish, salsa, and pickles. Pair our sausage or your meatballs with locally made pasta sauce and premium imported pasta!